"The spiritual nature is eternal, and even when all the material universes are destroyed, the planets in the spiritual world abide. They remain exactly as the spirit soul remains even after the annihilation of the material body. That spiritual world is called the aprakrita (antimaterial) world. In this transcendental, spiritual world or universe, the highest planetary system is known as Goloka Vrindavana. That is the abode of Lord Krsna Himself, who is also all-spiritual. Krsna is known there as Aprakrita-madana. 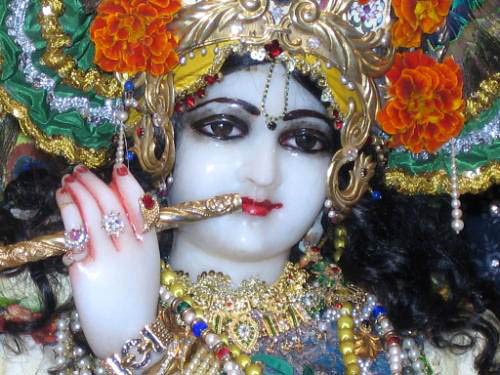 The name Madana refers to Cupid, but Krsna is the spiritual Madana. His body is not material like the body of Cupid in this material universe. Krsna's body is all-spiritual -- sac-cid-ananda-vigraha. Therefore He is called Aprakrita-madana. He is also known as Manmatha-madana, which means that He is attractive even to Cupid."